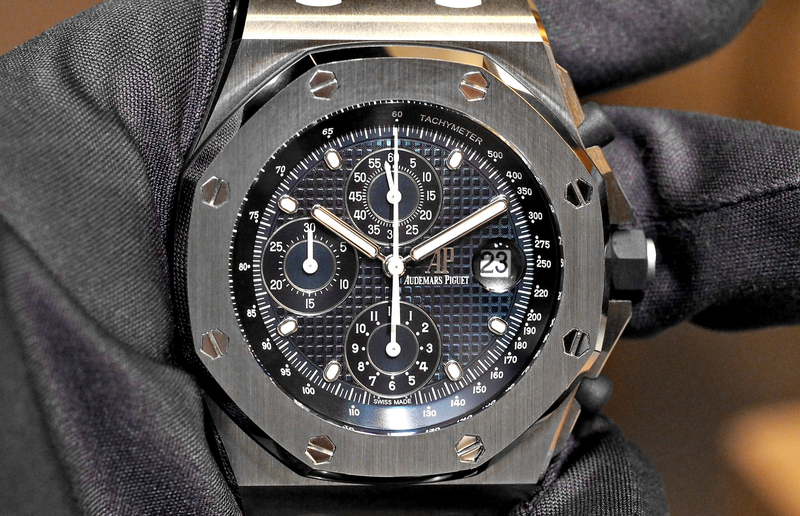 Of course, the Royal Oak, which debuted in 1972, was a game changer for Audemars Piguet. Just over two decades later, in 1993, another important timepiece came to life: the Royal Oak Offshore. Like the Royal Oak, the Offshore features a steel case, octagonal bezel, and hexagonal screws. It’s the bigger, sportier younger brother to the more sleek, refined Royal Oak if you will. 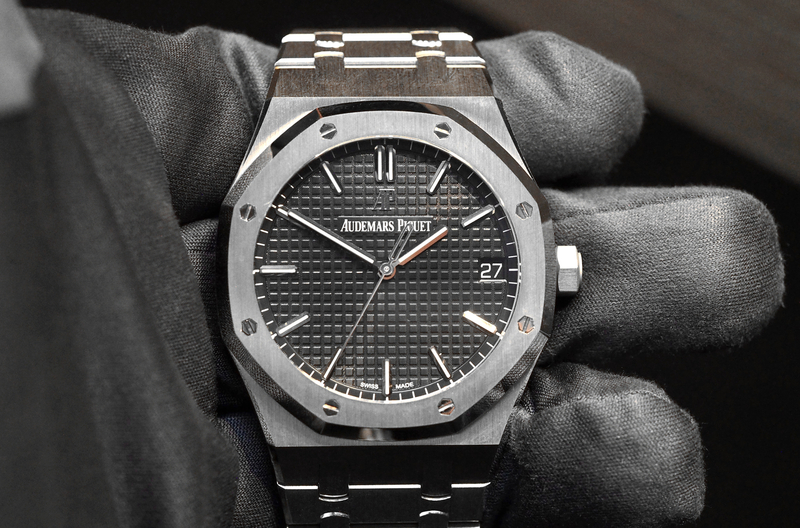 This year at SIHH – 25 years later – Audemars Piguet unveiled a re-edition which takes the key elements from the original 1993 Royal Oak Offshore and offers it in a modern version (Ref. 26237ST.OO.1000ST.01). The watch measures 42 mm x 14.4 mm and features a blue dial with “Petite Tapisserie” pattern, blue counters, a blue inner bezel, and white gold applied hour-markers and Royal Oak hands with luminescent coating. The pushers and crown are coated in a blue vulcanized rubber, as they were on the original. The watch is presented on a stainless steel bracelet with AP folding clasp. The crown is screw-locked, the caseback is solid and screwed-down, and water-resistance is 100 meters. Beating at 3Hz, self-winding caliber 3126, which has a monobloc 22K gold rotor with engraved Audemars Piguet motif that winds the barrel in both directions, drives hours, minutes, small seconds, date, and chronograph functions. The power reserve is good for 50-hours. Each movement is finished with circular graining on the mainplate, Geneva stripes and chamfering on the bridges, and consists of 365 components, including 59 jewels. 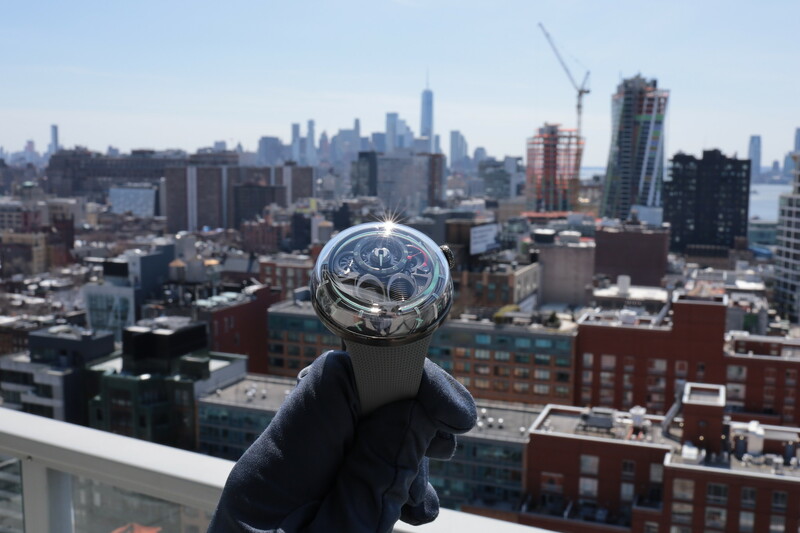 The chronograph is actuated by a cam and lever and uses a free sprung balance wheel. This is a boutique exclusive and retails for $27,000.